Frontiers in Human Neuroscience, 8:107 (2014). Both at rest and during the executions of cognitive tasks, the brain continuously creates and reshapes complex patterns of correlated dynamics. 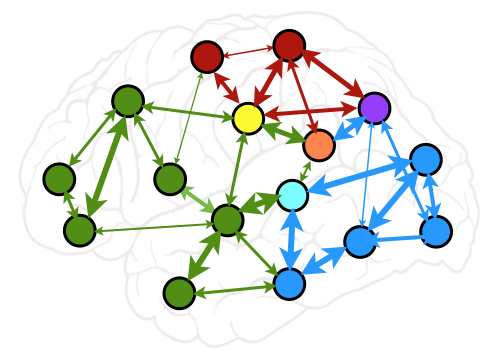 Thus, brain functional activity is naturally described in terms of networks, i.e. sets of nodes, representing distinct subsystems, and links connecting node pairs, representing relationships between them. Recently, brain function has started being investigated using a statistical physics understanding of graph theory, an old branch of pure mathematics (Newman, 2010). Within this framework, networks properties are independent of the identity of their nodes, as they emerge in a non-trivial way from their interactions. Observed topologies are instances of a network ensemble, falling into one of few universality classes and are therefore inherently statistical in nature. Functional network reconstruction comprises various steps: first, nodes are identified; then, links are established according to a certain metric. This gives rise to a clique with an all-to-all connectivity. Deciding which links are significant is done by choosing which values of these metrics should be taken into account. Finally, network properties are computed and used to characterize the network. Each of these steps contains an element of arbitrariness, as graph theory allows characterizing systems once a network is reconstructed, but is neutral as to what should be treated as a system and to how to isolate its constituent parts. Here we discuss some aspects related to the way nodes, links and networks in general are defined in system-level studies using noninvasive techniques, which may be critical when interpreting the results of functional brain network analyses. ← Why should cognitive neuroscientists study the brain’s resting state?